AMAZING product. perfect crunch, exact amount of chocolate taste and not to bad as for healthy for you. Perfect carbs and fiber. Highly recommend! We buy 6 at a time! 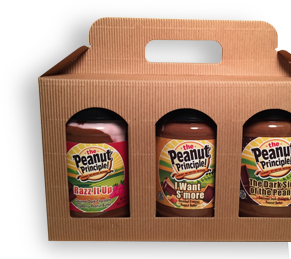 Is there anything The Peanut Principle makes that isn't incredible? The answer is NO! This is another winner, along with Brownie Points, I Want S'more, and Dashing Through the Dough. There is just enough chocolate flavor to satisfy my inner chocoholic. I don't know how the quinoa stays so crunchy, but it does...right to the last scoop from the bottom of the jar. Nom nom! Yay, first to review this delicious chocolate crunchy peanut butter. The crunch tastes like little pop rocks and it tastes like peanut butter with a hint of chocolate. If you want more of a chocolate taste then I would recommend the brownie points but this one is still very delicious.